Our lab explores the symbiotic spectrum by studying the intimate interactions between amoeba hosts and their bacterial symbionts. Broadly defined, symbiosis is a "close living together of unlike organisms" (DeBary). As such, symbioses encompass a broad array of interactions that span a continuum of outcomes; from parasitism to mutualism. Our lab uses the social soil-dwelling amoeba Dictyostelium discoideum as a focal eukaryotic host for bacterial symbionts. First, we identify and characterize natural bacterial symbionts of soil amoebas. Next, we explore the outcomes, contextual modifiers, evolutionary pressures, and mechanisms underlying these symbiotic interactions. Ultimately, we hope that this micro-biological system can be applied to address macro questions about organismal interactions; such as: How are interactions influenced by ecological context? What factors promote symbiont fidelity vs. promiscuity and how are species barriers maintained or overcome? What forces shift the evolutionary trajectory of interactions? And- What are the molecular mechanisms that underlie antagonistic vs. mutualistic interactions and how do these factors mediate outcomes? D. discoideum is a tractable eukaryotic model organism well suited for studying a variety of processes including chemotaxis, cell signaling, cell differentiation, and phagocytosis. It is particularly compelling as a system for studying eukaryote-bacteria interactions as it is a predator of bacteria prey and can be infected by a variety of important bacterial pathogens. In the wild, D. discoideum lives in soil and loose leaf litter. It has a unique life-cycle, transitioning from single cellular to multicellular stages. When in the amoeba vegetative stage, cells eat bacteria via phagocytosis and multiply through binary fission. When amoeba numbers are high and food is depleted, amoebas can either transition to a social or a sexual stage. In the social stage, amoebas aggregate to ultimately form a multicellular fruiting body, consisting of a thin stalk of dead structural cells supporting a bulb like sorus containing hardy reproductive spore cells. 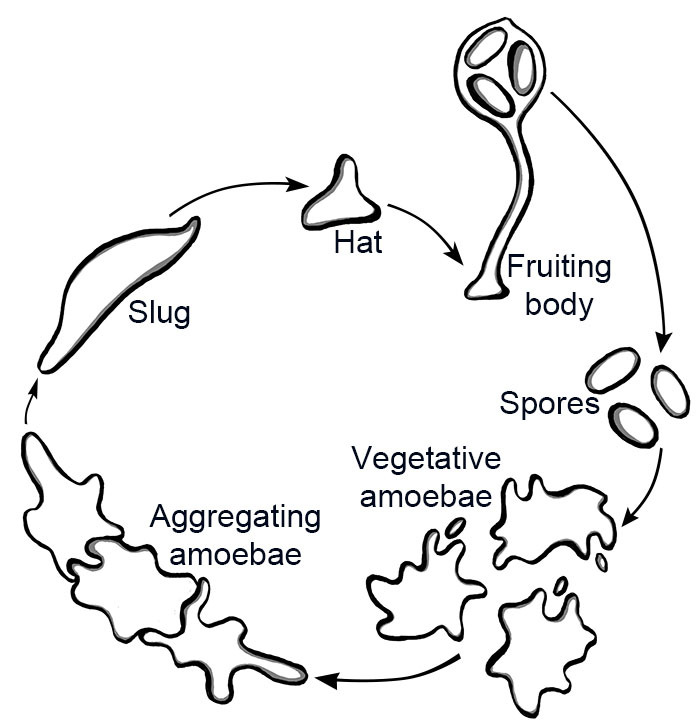 When spores are dispersed to new favorable environments, they germinate into vegetative amoebas and the cycle continues. Our lab is specifically interested in understanding naturally occurring bacteria-D. discoideum associations and exploring their underlying mechanisms and overt manifestations. The predominant bacterial symbionts that we study belong to the plant beneficial and environmental cluster of Burkholderia. Several distinct species within this genera intracellularly infect amoeba hosts and persist throughout development. These infections have been estimated to be present in approximately a quarter of the D. discoideum wild population. Other symbionts of interest include Neochlamydia and Amoebophilis, which are unculturable bacteria that infect roughly fifty percent of the amoeba population. Finally, we are also in the process of isolating and characterizing bacteriophages specific to Burkholderia species and investigating their effects on the Burkholderia-D. discodieum association. Please visit our research page for more details. Top photo shows vegetative amoebae (phalloidin stained and colored yellow) and Burkholderia symbiont cells (RFP labeled and colored purple). Bottom photo shows spore cells (calcofluor stained and colored yellow) and Burkholderia-RFP cells (colored purple). 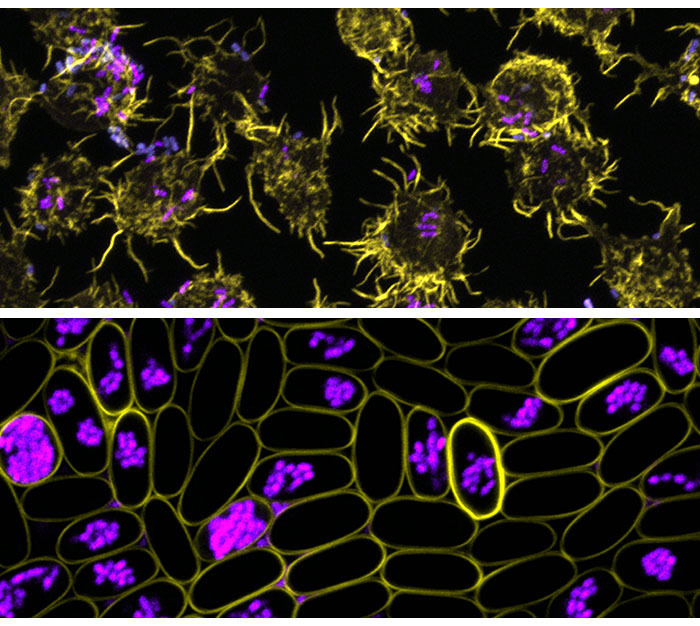 Both images were aquired by confocal microscopy.